The most common source of clogged toilets is, of course, toilet paper. To avoid clogs, it’s important to know not to wrap or ball up toilet paper into a large mass while using, as it can condense and cause a stoppage. Young children are common culprits for balling and wrapping toilet paper into large, unflushable quantities. Do your best to let them know this isn’t the best way to flush. Don’t be afraid to flush twice if using a large amount of paper. Wet Wipes: baby wipes and cleaning wipes of all kinds are commonly flushed down toilets, but even brands that claim to be flushable can often cause a clog. Tissues: Like wet wipes, tissues may seem like they’re OK to flush, but some may have a difficult time breaking down with water, causing them to clump together and clog drains. Flush toilet paper only. Feminine Hygiene Products: Don’t flush tampons or pads down the toilet. As a product designed to retain fluid and expand, these are some of the worst items you can flush, and are a common source of toilet stoppages. Condoms: condoms and condom wrappers can wreak havoc on your drains. Condoms can act as latex balloons that can catch and fill in your drain, causing stoppages. Food: It may seem obvious, but a surprising amount of people try to flush food down their toilets. Food should never be flushed, even liquid food products like grease or oil. Toys: Sometimes children may flush toys down the toilet, often out of curiosity. Toys can cause major stoppages, and often require a plumber to remove them. Dental Floss: Not only can dental floss cause potential clogs, but it also isn’t biodegradable, so it can cause damage to waterways. Q-Tips and Cotton Balls: Q-tips, cotton balls and other cotton products can cause problems due to their tendency to clump together, particularly when exposed to water. The best first step anytime one of your toilets clogged is to pull out the plunger. Start by establishing as tight of an air seal as possible over the opening in your toilet. Plunging is best done by using strong, rhythmic pulsing, while maintaining an air seal. You should hear a sucking sound inside the commode. You’ll know you got the blockage when whatever is causing the clog comes up. If the stoppage is not in the toilet bend, but further down the drain line, call a plumber. Machine augers are used to get down the lines to clear stoppages. It’s fine to try to fix the stoppage yourself at first to avoid paying for a plumber (so long as you don’t try any ridiculous methods) but if you’re having any trouble, leave it to a professional. Plumbers have the equipment to deal with even the toughest clogs, such as toilet augers and drain machines, and their experience will help keep the problem from becoming worse. 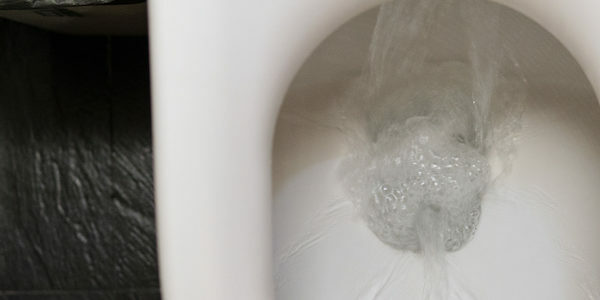 To avoid potentially costly damage to your plumbing system, leave serious, persistent clogs to a trained plumber. For your plumbing needs, contact Greenwave Plumbing today.